Everyone would like answers to these types of questions. Armed with that kind of information, you could take a lot of guesswork out of big decisions and plan strategies with confidence. With @RISK®, you can answer these questions and more – right in your Excel spreadsheet. Start by replacing uncertain values in your spreadsheet with @RISK probability distribution functions, like Normal, Uniform, or over 50 others. These @RISK functions simply represent a range of different possible values that a cell could take instead of limiting it to just one case. Choose your distribution from a graphical gallery, or define distributions using historical data for a given input. Even combine distributions with @RISK’s Compound function. Share specific distribution functions with others using the @RISK Library, or swap out @RISK functions for colleagues who don’t have @RISK. Next, select your outputs—the “bottom line” cells whose values interest you. This could be potential profits, ROI, insurance claims payout, disease recovery rate, or anything at all. @RISK comes with over 50 distribution functions. These are true Excel functions, behaving the same way as Excel’s native functions and giving you total modeling flexibility. Choosing which @RISK distribution function to use is easy because @RISK comes with a graphical distribution gallery that lets you preview and compare various distributions before selecting them. You can even set up your distributions using percentiles as well as standard parameters, and overlay different distribution graphs for comparison. You can use historical or industry data and @RISK’s integrated data fitting tool BestFit® to select the best distribution function and the right parameters. You can select the type of data to be fit (e.g. continuous. discrete, or cumulative), filter the data, specify distribution types to be fit and specify Chi-Squared binning to be used. Fitted distributions are ranked based on three statistical tests, and may be compared graphically. You can even overlay graphs of multiple fitted distributions. Fit results can be linked to @RISK functions, so the functions will update automatically when input data changes. @RISK functions can be stored in the @RISK Library, a SQL database for sharing with other @RISK users. @RISK functions may also be removed with the Function Swap feature, enabling your models be to shared with colleagues who don’t have @RISK installed. @RISK will keep track of any changes that occur in the spreadsheet while the @RISK functions were “swapped out.” You can control how @RISK should update formulas when it finds changes in the model. In addition, you can have @RISK automatically swap out functions when a workbook is saved and closed and automatically swap in if necessary when a workbook is opened. 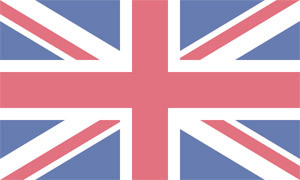 The result of a simulation is a look at a whole range of possible outcomes, including the probabilities they will occur. Graph your results with histograms, Scatter Plots, cumulative curves, Box Plots, and more. 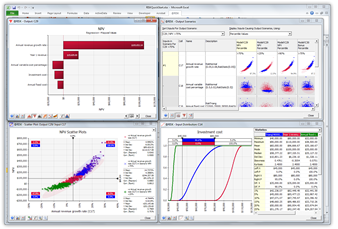 Identify critical factors with Tornado charts and sensitivity analysis. 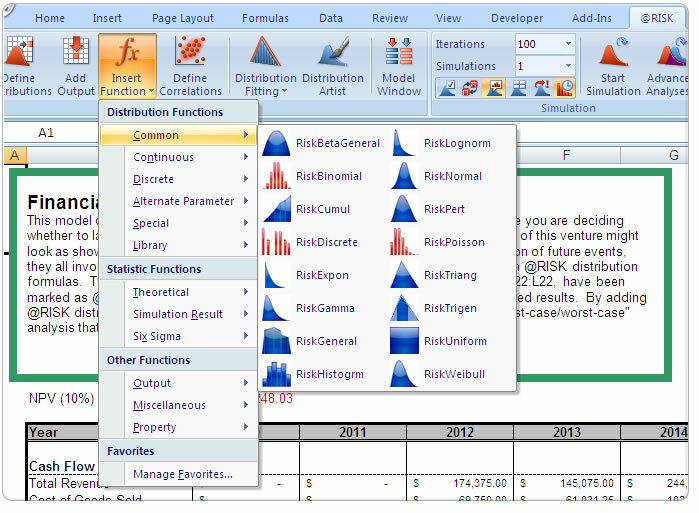 Paste results into Excel, Word, or PowerPoint, or place them in the @RISK Library for other @RISK users. You can even save results and charts right inside your Excel workbook. 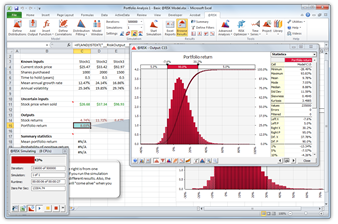 @RISK provides a wide range of graphs for interpreting and presenting your results to others. Histograms and cumulative curves show the probability of different outcomes occurring. Use overlay graphs to compare multiple results, and summary graphs and Box Plots to see risk and trends over time or over ranges. 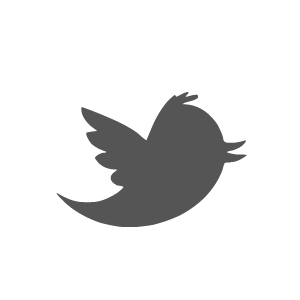 Right-click menus and handy toolbars make navigation a snap. All graphs are fully customizable—including titles, axes, scaling, colors, and more—and ready for export to Excel, Word, or PowerPoint. You can watch results graphs pop up as you browse through cells in your spreadsheet. Click the Simulate button and watch. @RISK recalculates your spreadsheet model thousands of times. Each time, @RISK samples random values from the @RISK functions you entered, places them in your model, and records the resulting outcome. Explain the process to others by running your simulation in Demo Mode, with graphs and reports updating live as the simulation runs. New @RISK 7.0 offers a range of improvements for any decision maker, from general use enhancements to new, specialized analytical features. Enhanced model-sharing, improved reporting, and sophisticated new analyses make @RISK 7 the only risk analysis tool you’ll need. Especially useful in financial analysis, Efficient Frontiers determine the optimal return that can be expected from a portfolio at a given level of risk. This analysis is included with RISKOptimizer, the optimization component of @RISK available in the Industrial edition. Also useful in the financial community, copulas provide sophisticated methods for correlating uncertain @RISK variables that give the user more control over the correlation pattern. Allows you to display any spreadsheet data, not just simulation results, using all @RISK charts and graphing options. Graphically share input distributions and simulation results with those who do not have @RISK installed on their computers using new Thumbnail graphs. They can simply open your workbook and see @RISK graphs attached to the cells they describe — no special viewer required! New custom Excel reports in @RISK enable you to create exactly the simulation results reports you want directly in Excel, automatically formatted for optimal viewing. Users can choose to receive automatic notification of future updates from within @RISK, with a one-click installation system. Compatibility: @RISK and DecisionTools Suite software is compatible with all 32-bit and 64-bit versions of Microsoft Windows XP through 10, Excel 2007 through 2013, and Project 2007 through 2013. © Copyright 2019 Palisade Corporation. Applicazione (add-in) che fornisce all’utente di Microsoft Excel o Lotus 1-2-3, la possibilità di effettuare analisi dei rischi e simulazioni.